Ali Tajvidi, Iranian composer who created enormous pieces of music during his lifetime, died after 7-years of struggling with disease. Tehran, 16 March 2006 (CHN) -- Ali Tajvidi, Iranian master of music and composer died yesterday in Tehran after suffering from respiratory disease for 7 years. The death of this great artist brought for his family, friends, and art enthusiasts grief and sorrow. 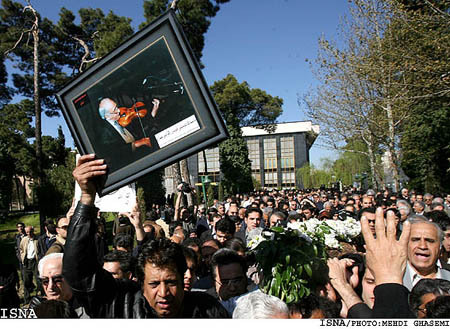 His funeral will be held Saturday morning, 18th of March 2006, in the artist section of Behesht-e Zahra Cemetery, south of Tehran, with the presence of Iranian artists, intellectuals and those who love his music. Tehran, 16 March 2006 (CHN) -- Ali Tajvidi, Iranian master of music and composer died yesterday in Tehran after suffering from respiratory disease for 7 years. The death of this great artist brought for his family, friends, and art enthusiasts grief and sorrow. His funeral will be held Saturday morning, 18th of March 2006, in the artist section of Behesht-e Zahra Cemetery, south of Tehran, with the presence of Iranian artists, intellectuals and those who love his music. Ali Tajvidi was born to an art-loving and artistic family in 1919 in Tehran. Hadi Khan, his father was one of the founders of the miniature style and an outstanding student of the distinguished painter Kamalolmolk. Hadi Khan was familiar with music and learned to play the Tar (the Persian traditional music instrument) from Darvish Khan. Tajvidi was only 10 years old when he started to play a kind of pipe common in south of Iran. After a while, he developed a liking for flute and practiced it under the supervision of Zahireddini, music master of the time. Gradually, he became such a skilled player that he would play the instrument in different cultural gatherings. Notwithstanding, he felt that flute did not satisfy his inner desires, which prompted him to turn to violin for two years under the guidance of Hossein Yahaqqi and later the eminent musician Abolhassan Saba. 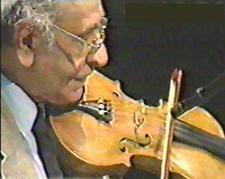 Saba encouraged Tajvidi to learn the European style of playing the violin after he mastered the Iranian techniques. Tajvidi did so under Melik Abrahamian and Babgen Tamberzian. Tajvidi has composed about 100 pieces. Composing music for movies and compiling books on Shur and Mahur techniques in Persian music are his other works. He had also cooperation with several contemporary artists. Islamic Republic of Iran Broadcasting (IRIB) honored him during the Fourth Eternal Figures Gathering in 2004, but he was bedridden at home due to the disease and his son accepted the award for him at the ceremony.